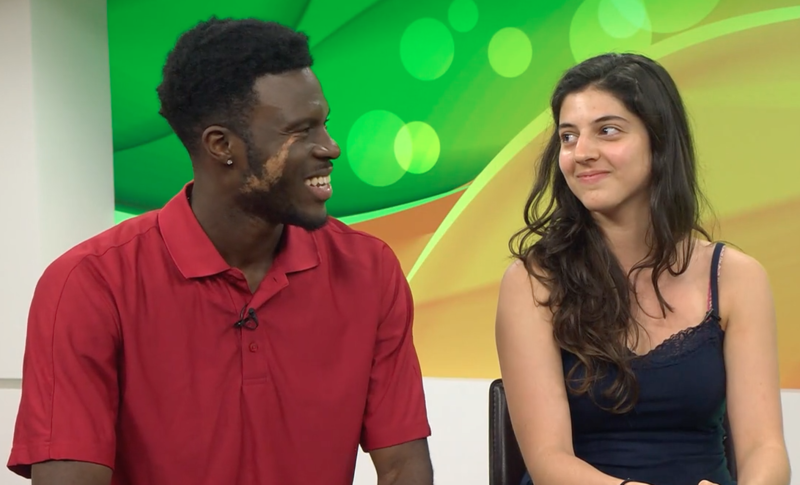 Seniors Christel Wekon-Kemeni and Katerina Constantinou on UMTV’s Pulse speaking about their preparation experience for the Dancing With the UMiami Stars event that will take place on Friday. Talent aplenty thrives at the University of Miami, and the Dancing With The UMiami Stars event will give known UM students and faculty the opportunity to showcase some of their dancing abilities. Dancing With the UMiami Stars is an annual dance competition that pairs UM faculty or students with members of the Miami Ballroom Club to perform choreographed pieces. The UM “stars” are nominated by their peers and are chosen according to the number of “likes” they get during a social media voting period. Senior Christel Wekon-Kemeni was one of the chosen stars, and has been working hard to learn what it takes to tango and foxtrot. He will be one of the ten competitors that will perform to a panel of previous “stars,” dancers and known members of the UM community. Wekon-Kemeni’s partner, senior Katerina Constantinou, has four years of dancing experience, something that proves to be useful when choreographing routines for the competition. Constantinou explained that though there are judged categories in the competition, participants have their eyes on the most important of all – crowd favorite. In order to win, numerous participants must put in hours of weekly, and sometimes daily, rehearsals with their partners. Competitors choreographed the routines and collaborated chose the songs and styles of their performances. Fairbrother explained that this is the fifth year the event has been taking place and that, while previous installments have been centered around a theme, this year’s competition has been left more open-ended. “This year we decided not to have a theme, as it allows for more freedom in choreography and song choice to create dances that the stars and team members are excited to perform,” Fairbrother said. Choreographies will be separated into Latin and ballroom styles such as salsa and the foxtrot. Though these are unprecedented dance types for many of the UM “stars,” their dedication to learn will result in great performances, according to Fairbrother. The Dancing With the UMiami Stars competition will take place at 8 p.m. Friday at the Rock.